Learning to draw a simple fish is a fun, easy project. You'll need some bond paper or drawing paper and a #2 or softer pencil. You'll also want a kneaded or plastic eraser so you can clean up your drawing as you work. If you like, you can also use crayons, markers, colored pencils, or paints to add color to your finished drawing. Both children (elementary school age and older) and adults should be able to draw this fish. The fish's body is an oval shape. You'll probably want to place your paper in landscape (horizontal) position, because the fish is longer horizontally than it is high. 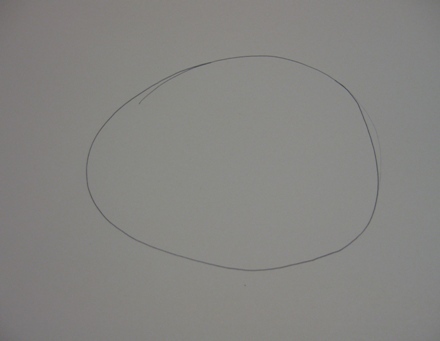 Sketch a large oval in the center of your paper. The fish's tail can be sketched in with two tall triangles. Leave room between the oval and the two triangles. In the next step you will join the two together. Connect the tail to the fish's body with two curved horizontal lines. Draw two slightly curved vertical lines to connect the points of the triangles that define the tail. Then, gently erase the triangular sketch lines inside the tail. Add a curved line to define the fish's head and gill. Add a round eye; add a dark pupil with a white highlight in the center of the eye. Add upper and lower lips to the fish with curved lines. If you're not happy with the features you've drawn, erase them and try again. Your fish won't be able swim unless you add fins. Add one fin to the side of her body, close to the curved line that defines her gills, and two fins to her underside - one close to the head and one closer to the tail. Draw a large dorsal fin on the fish's back. Now you can add details to your fish. Add scales to the body. Add lines to define the spines of all the fins. If you like you can draw bubbles coming from the fish's mouth. Use an eraser to clean up any extra lines. At this point, you can add color to your drawing. You can also create a habitat for your fish by drawing in sand under your fish and water plants around her. Draw a frog to give your fish some company. Once you've mastered drawing a fish, you can create your own design using the same techniques. For instance, if you lengthen the oval for the body, change the shape of the eye, and make the fins and tail longer and flowing, your fish will look completely different from the one here.